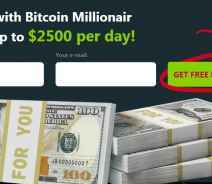 Is Bitcoin Millionaire Today a Scam? Beware, Read this Review! 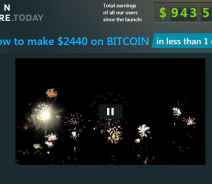 The BitcoinMillionaire.TODAY is the latest web-based software offering to help you invest in the fast-paced, action-packed, profit-filled cryptocurrency market. Don’t worry, I know what you are thinking, this is not just another marketing scheme. The website doesn’t want to sell you anything at all. All it, and I call it and it because there is no information about the company, the owners or anyone involved with the program other than a voice name Victor Gray. All it wants to do is to help you make enormous amounts of money. In fact, users of the program can make up to $2,500 on the first day. So far, members of the system have racked in more than $943,000,000,000 (billion) dollars, if you can believe that and I know you can because this is the Internet we’re talking about and the Internet never lies. The BitcoinMIllionaire.Today website is here to provide access to state of the art trading software designed to take advantage of the highly volatile and ever-growing cryptocurrency market. He says it does not take advantage of a one time loophole, the system works indefinitely, he also says it’s not a scam and that you can make serious money. He says serious money like 10 times in a row so you know it must be a lot. The reason why it works so well is that it makes 61.3% less losing trades than any other robot on the market. Because of the designer, Victor Gray or whoever he his, understands how valuable your hard earned money is, and to ensure the robot maintains its outstanding success rate, it only takes trades when it is 99% sure of the outcome. He even pulls up a shot of his handy dandy trading account, one that he only opened a few days ago, so that we can how great the software is. According to the stats, he shows it was profitable about 98% of the time. He does admit that 98% is a bit high and that actual results will be closer to 92% in the long term. 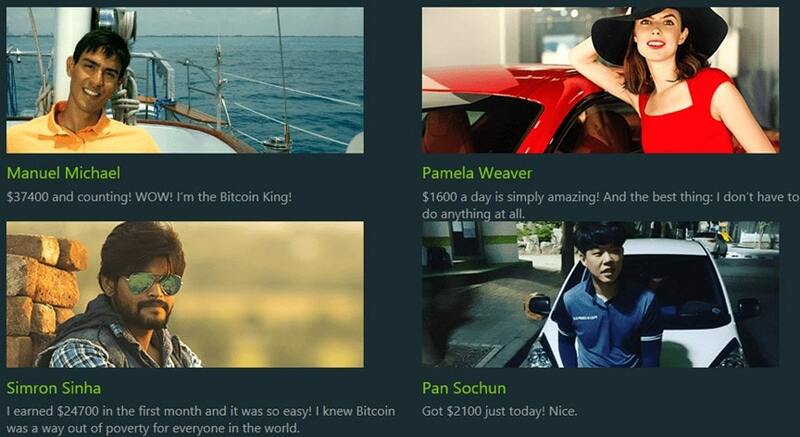 The Guy Behind Bitcoin Millionaire Has No Shame? I’ve seen a lot of scams and a lot of pitch videos for binary options, bitcoin, and autotraders. For the most part, they are tame, they play on greed and our innate desire to win. Every once in a while I run across a nasty one. One that preys on the weak, targets the poor and takes advantage of hardship cases and this is one of the worst. The video has nothing to do with trading, it is no more than a sleazy con man trying to take money from the people who can afford to lose it the least. It starts off like this. He talks about money, how it’s nice to have money, the things you can buy with money and the freedom it can give you. Then he moves on to talk about how some people have it harder than others, they may have experienced a tragedy, and how they could really really use the free and easy money the system provides. Still no talk about what the system is, what it does or how to use it. From there he goes on to say how only 500 people are ever going to see this video. Not only that, the people that are going to see have been specially selected by trusted partners and invited to watch. The reason they were specially selected? Because they’d been prescreened and categorized in someone’s database as a hardship case, in financial need and eager to find a quick and easy way out. He says he wants to help you because he understands despair… but I don’t believe him. The Final Call – A BIG No! The system is free to use with a sign-up and registration with only the usual strings attached. . . you have to make a deposit with a broker. Sure, the software is free but all it is is another crappy autotrader from another crappy white label broker. If you are feeling poor, desperate for money or just looking for a way to make an extra buck this isn’t it. Save your money for something you have a chance of winning, like the lottery. The Final Call - A BIG No!